Helen I. Barsy, age 96, of Lancaster, died on Tuesday, February 5, 2019 at Hospice & Community Care. Born in Phoenixville, Pennsylvania, on September 2, 1922, she was the daughter of the late Webster and Ione (Friday) Yeager. She was married to the late Imre J. Barsy for 61 years. Helen attended Phoenixville schools. After being graduated from Phoenixville Senior High School in 1940, she enrolled at Wilson College, Chambersburg, Pennsylvania from which she was graduated in 1944 with an A.B. degree in Chemistry. She then accepted a position in the Research Department at Armstrong Cork Company in Lancaster. 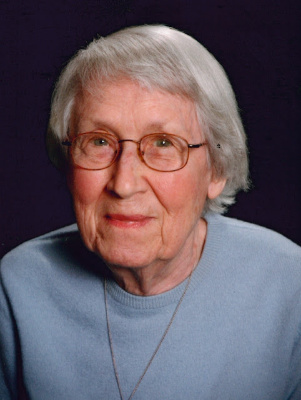 In order to raise her family and do volunteer work, she left Armstrong’s chemistry laboratory in 1951. She continued her Girl Scout activities, becoming a Brownie leader. Helen transferred her church membership to Lancaster’s First Presbyterian Church in 1956, where she became active in women’s organizations. In 1965 she was among the first women to be ordained an elder. She also later served as a deacon. While preparing for what she anticipated being a volunteer reading tutor, she was employed as a reading teacher at Smoketown Elementary School in the Conestoga Valley district. To be certified, she enrolled at Millersville University, earning her M.Ed. degree in 1972. She continued teaching until her retirement in 1985. For the next ten years she served as a docent at Wheatland, the home of President James Buchanan. Then she concentrated on activities related to the history of First Presbyterian Church, including writing the chapter on missions for the book 1742-1992: 250 Years of Witness which was published as part of the church’s 250th anniversary commemoration. She also wrote the text for a booklet about the church’s historic stained-glass windows. Together with a long-time friend, she undertook the endless task of organizing and filling articles of historic significance for the church’s archives. In 2011, Helen moved to Homestead Village where she enjoyed many volunteer, educational and recreational activities. Helen is survived by a son and a daughter, Imre J. Barsy, Jr. (Debra) of Yucca Valley, California, and Louise E.B. Colgan (Sean) of Newark, California. She also leaves one grandson, Imre J. Barsy, III (Shannon) of Newbury Park, California and their daughters, Rebekah and Rachel. She was preceded in death by two brothers (Howard and Tom) and an infant son (Kent). You certainly have my most sincere sympathy after learning that Helen died. I taught with her at Smoketown for years, actually carpooling with her for several years before she retired. You will be in our thoughts and prayers during this difficult time. She will be sorely missed. How many ways have I known your Mother? I met her first as a neighbor, then as church friend at First Presbyterian, also as a member of the Wilson College Club and later, when substitute teaching at Smoketown Elementary School. Your Mother was a fine person, always striving to do the best work possible in whatever endeavor she pursued. How fortunate our church is to have benefitted from the historical research she really enjoyed. How caring a Mother she was for you both. Harvey and I send our deepest sympathy. Your Mother will be greatly missed and fondly remembered. Imre and Louise- So sorry for your loss. I remember your mother in the fond memories I have of us getting together in our neighborhood . Sincere sympathy to you and your families. With sincerest sympathy to you, Imre, and your family. Imre & Louise, I am sorry to hear of you mothers passing. She was a warm lovely lady. She was a friend of my aunt (Jane Kulp and my mother Jane Breneman). I always enjoyed visiting her at Thanksgiving in Homestead when I can to town. She appreciated the flowers I would bring her and was always intereted in our famity . Condolences to the Barsy family. Our thoughts and prayers go out to your whole family. Psalms 147:3 says God, “heals the broken hearted, and binds up their wounds.” May God bring you comfort and peace.